Sometimes I forget how loud snow can be. 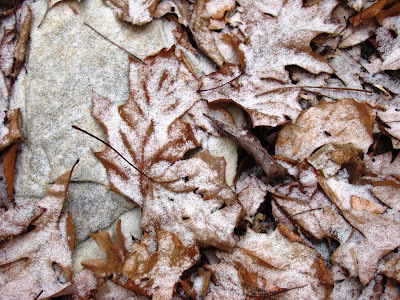 Before snow covers the ground and muffles the sound of the flakes that follow, the first snowflakes strike the fallen dry leaves on the forest floor. Those flakes are not silent, and at least when forest covers the land as far as I can see, they aren’t even particularly quiet. This morning, my first thought when I stepped outside was that it was sleeting. But when I brushed my hand along the deck railing, soft, powdery snowflakes took to the air and danced around as lightly as confetti. Who would guess that something so light, so airy, so tiny as a snowflake could make as much noise as sleet? They do. Perhaps it’s simply because the forest covers so much territory around the cabin that their sound is magnified that much. Perhaps it’s because the mornings here are so quiet and devoid of loud human noises that gentler sounds can predominate. Those two both contribute to how much I can hear around me, naturally, though I don’t think those are the sole causes. It’s simpler than that. Dry, powdery snow falling on dry leaves is just noisy. It’s one of those things that I never noticed when I lived in a town surrounded by grassy yards. It’s also one of those things I tend to forget from year to year, so every new winter season brings a new revelation of remembering. New years, new rememberings. What’s old becomes new again. The turn of the seasons is nature’s way of reminding us to remember again what we used to know and what we can know again. Nature’s gifts are ever boundlesss. Only a week and two days have passed since the shortest day of the year. Already, I notice the increasing minutes of daylight. In the morning before I leave for work, the light is already closer to day’s light than to night’s darkness. In the evenings, the sunset is officially just 4 minutes later than it was at Solstice, but the day’s light lingers to almost 5:30 p.m. Somehow, that tiny amount seems like a small victory, the kind of relief that brings a contented sigh. "You’ve made it, again," are the unspoken words that seem to hang in the air. It hardly seems to matter that more winter lies ahead than is behind. It hardly seems to matter that winter’s hold will likely not ease much for another two months. Today it matters only that it’s no longer dark when I leave the house and dark when I return in the evening. 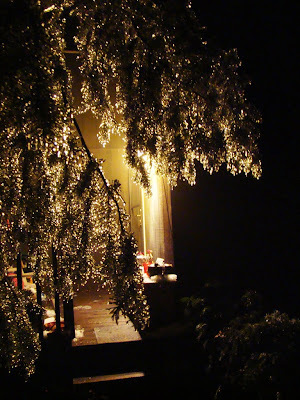 My photo today is another one from the Christmas Eve ice storm. My solar lights hang from the clothes line, but all you can really see is ice, ice and more ice. As you will be able to tell from the photos I will be posting over the next few days, I’ve had a "bit" of ice. Christmas Eve turned out to be the diciest of the days, probably because I wasn’t anticipating problems. The forecast promised "no accumulation." The forecast promised temperatures of 40 degrees. So between 7 and 8 a.m. the skies opened up, and freezing rain soon blanketed everything in less time than I would have guessed possible. And then the temperature didn’t rise, and didn’t rise, and didn’t rise. As you can imagine, the longer it went on without going above freezing, the worse I was starting to feel. I still had a bit of food to buy. I was supposed to be hosting a Christmas Eve party in the evening out at my parents’ farmhouse. The lane was more than a sheet of ice. It was panes of glass thick. Around noontime one of the Roundtop boys tried to cinder the hill. It took him 3 pickup loads to make it past my cabin and then up to my neighbors’ A-frame. He stopped and we chatted as he inched his way back down the mountain. I think he was relieved to stop for a moment or two and take a few deep breaths. The road was that bad, and I could see white-knuckles. He'd been forced to take off his gloves to get a better grip on the steering wheel of the truck. He promised to try and cinder my lane, but then he couldn’t get the whole way in and was eventually forced to give up. Fortunately for me, he was able to cinder the "intersection" between my drive and the lane, which turned out to be a huge help, little Christmas Even present. I threw down an entire container of anti-skid between the intersection and where my car was parked. It’s a straight shot from there out to the lane, so I gunned the engine up to the lane, then turned a hard left and braked like crazy going down the hill and—I made it. Once out, the situation improved. The temperature did, eventually, rise above freezing sometime late in the afternoon and then kept rising, even after dark. I like to think of that as another little Christmas Eve present, one that allowed my family to spend the evening together, eating and chatting and not doing much of anything. That was the best present of all. Although it was just 8 degrees at the cabin this morning, the brutal 40 mph wind has finally died down, and frankly, after yesterday, this morning feels almost balmy in comparison. Suddenly, 8 degrees is fine and glorious weather. The birds are already more active at the feeders this morning. The dogs no longer have their noses buried under their tails. The cats—okay, so the cats are still sleeping on top of me. Yesterday’s weather kept the local woods residents as hunkered down as I was. Today, deer blink in the bright morning sun and step cautiously out of their hiding places. Squirrels arrived, hungry, to the bird feeders before the sun was up. It’s not only humans who appreciate a calmer day. I even heard a bluebird. We share a lot with the animals who live on the earth with us. Often, I think, we don’t realize how similar we all are. Too often, we think of any animal other than humans as "them," a word that immediately points up our differences and ignores the similarities. If you’ve ever seen a doe gently nudge her new fawn or watch three young raccoons get into more trouble than their mother can deal with, the similarities suddenly become a lot more clear. If all you see are the things that makes a hawk, say, different from a person, you won’t learn to appreciate the struggles of their lives. We may say that their killing another creature for food is cruel, especially when their prey is a "cute" animal, while we think nothing about eating that hamburger. Nature is what it is: a system of life and death of which we are a part. Other animals, other plants are also partners of that system with us. We each have a place. We each have a role. We need to remember not to hog the stage. Considering how much of the country is getting a major blast of winter at the moment, you’d probably prefer to see a photo of a nice, warm beach somewhere. Sorry. I don’t have any of those. I had an ice storm, just me and who knows how many other million people in the U.S.
After the ice, I had a bit of snow, then the temperature then dropped to 5F degrees, with a 40 mph wind. Suffice it to say that the dogs didn’t get much of a walk this morning. They didn’t seem to want one either, for which I am glad. For me, in the cabin, weather extremes always seem more extreme or perhaps simply more immediate. When I get to work, everything there seems so normal and distanced from what’s going on up on the mountain. That’s always a bit of a shock to me. 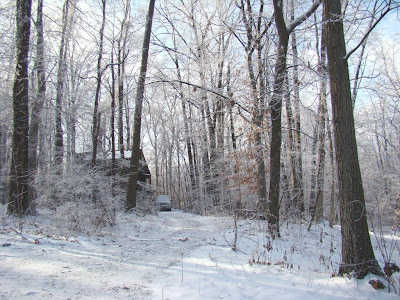 Last night, the wind roared, the trees creaked, a few branches landed on the cabin’s roof or in my driveway. When I had to leave the cabin, I did so as quickly as possible, bolting out the doors so I didn’t let out any of my precious warmth. I worried about the pipes freezing—there’s something about a southwest wind hitting the corner of the cabin that sometimes causes me problems. The cabin is warm, but sometimes I feel my hold on comfort is a fragile one, one that requires a lot of vigilance. I don’t mind that. In fact, I’m used to it, but there’s no doubt that living in the woods requires more from me during weather extremes than most people have to think about. Staying connected to the natural world isn’t always all beauty and glory. It’s a bit about taking what comes and dealing with that. From my point of view, ignoring the reality of what’s going on in the natural world by never venturing out of our comfort lessens our ability to see life as it really is. To me life is too precious not to see as much of it as I can. Winter days when snow cover is missing or light are great times to get into the forest and look for things. What things? It doesn’t matter. Look for whatever catches your eye and then learn more about it. 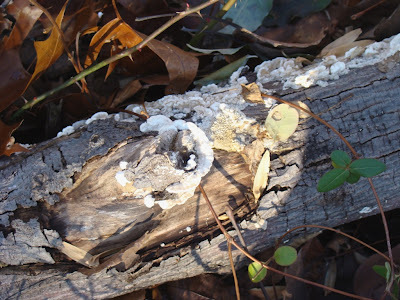 I’m still working on figuring out what the fungus is on this downed tree. I think it’s a small turkey-tail fungus, one that hasn’t reached its full spread yet, but I might be wrong. The nice thing about living where I do is that I can go back tomorrow and check it again to see if looks any different than it did last weekend. Although the forest is mostly brown right now and not particularly at a human’s version of its "prettiest" self, it’s a really perfect time to get out into the woods and look around. What makes now so special? For one thing, I don’t have much snow cover at the moment, so getting around the forest is easy. 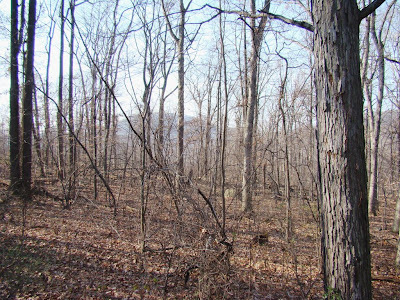 For another, all the seasonal growth and underbrush is down, so I can wander through the woods and not have to stay on a trail. 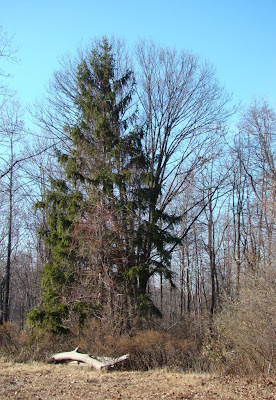 In the growing seasons, most eastern forests, Roundtop’s among them, have a goodly amount of underbrush. Sticking to a trail is virtually a necessity if you don’t want to come home covered with scratches. Fighting through underbrush is not fun. Plus, when you’re in the middle of it, you can’t really see much anyway. 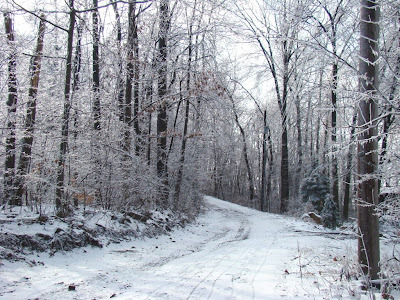 In winter before snow covers the ground to any depth, but after several hard freezes have killed the undergrowth, wandering through the forest off the trail is the one time such wandering is easily possible. Off trail, I get to look at new things. I pretty much know what I’m going to see along the trails. Oh, there are always surprises to be sure. But there’s a lot more surprises in those places I don’t see every day. Fifty yards off the trail and I’m in an entirely different place with entirely different things to look at. Now this is the point where I have to say that if you’re going to wander off a trail, you need to be careful about what you’re doing. Maybe at first you’ll want to keep the trail in sight. That’s okay, there will still be plenty of new things to look at. Once you know an area a little better, you can try wandering a little further, simply by using a little common sense and developing your own sense of direction and observation a bit. Probably the best way to not lose your way is as you’re wandering off the trail for the first time, take a moment to turn around and look behind you. That’s what you should see when you head back to the trail. A forest looks a lot different on your way out than on your way in, so pay attention to that. Another simple way is to follow a landmark, say a creek. They always stay in the same place, so if it’s on your right on the way in, it should be on your left on the way out. If you walk downhill on the way in, your should be walking uphill on the way out. I know this sounds simplistic, but in these days of GPS systems, it bears mentioning. I can’t tell you the number of people who get lost trying to find Ski Roundtop because they can’t read a map and apparently can’t follow their GPS either. I have drawers full of maps from all over the place, yet I know I’ve spent less on them over the past 30 years than one GPS system costs. Okay, so they take up more room. Big deal. Happy Friday. 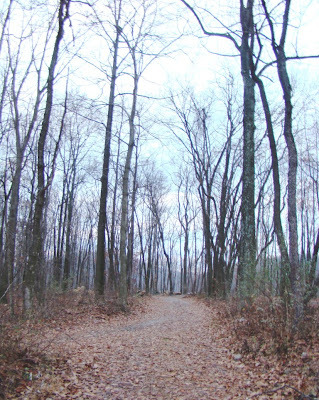 Take a little time out from holiday preparations this weekend to go play in the woods. You’ll be glad you did. "Two roads diverged in a wood..."
I don’t think I’ve ever looked at this split in the woods road near my cabin without thinking of Robert Frost’s poem, "The Road Not Taken." Perhaps it’s how the snow covers the roads, perhaps it’s how the trees frame the snow-covered paths, but this morning, that poem seems even more apt. Neither of these roads sees much traffic, and at the point where they split, one doesn’t look much different than the other. Unlike Frost, however, I have taken both paths at one time or another, and I can attest that their similarity ends here. The one continues along Roundtop’s access roads, the other grows ever narrower and winds down the mountain, eventually ending deep in the forest along Beaver Creek. In a way, their ultimate difference only emphasizes the meaning of Frost’s poem: different paths lead to different outcomes. A choice that doesn’t seem like much of a choice at the point where you make it leads to a vastly different outcome. And because we can’t see where either path goes, we have to choose which path to take without knowing where it will end up. 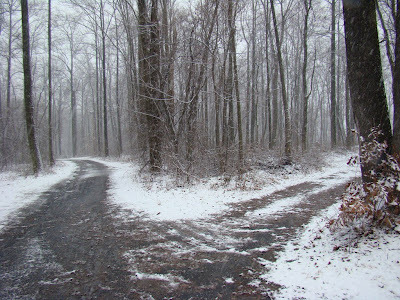 Frost chose the path "less traveled by," but he also acknowledged that both worn about the same, so his choice of the one "less traveled" was perhaps more of a judgment call than an obvious choice. That’s how most of life is: a judgment call based on limited information. You do your best. You move on. You hope you did the right thing. Perhaps the important thing is that you recognize the choice when you make it and know it will lead to a different place than the other one, no matter which path you choose, even if the roads look the same at the point where they split. A little snow, a little ice fell on the mountain yesterday. This photo comes from the earlier stages of the precipitation. By early evening I had about 4 inches of crunchy snow on the ground. After that some freezing drizzle fell, and the snow was compacted down. This time I was lucky. The heavy icing that was predicted didn’t fall here. That isn’t to say I didn’t have any icing, only that what I had wasn’t too bad. I’ve seen far worse. Sometime during the night I lost power but I didn’t know about it until I woke up and saw the digital clocks flashing. So even that wasn’t too bad. Yesterday afternoon the avian residents with whom I share this little corner of the forest emptied the feeders within an hour. I filled the feeders again and again and soon lost count of how many times I filled them. For the first time this season, juncos carpeted my deck, all waiting quietly and patiently for their turns on the platform feeder. Until this storm, I’d seen juncos regularly at the feeders, but it’s always been just 2 or 3 at a time. When my deck is dark with juncos, I know winter and a storm has arrived. Juncos are easier to count than many of my other visitors who flit in and out faster than I can keep track of them. Juncos just stand and wait their turn. And when they finish, they don’t disappear into the woods. They just go back to the deck railing or the deck itself and wait some more, waiting for their next round at the feeder. 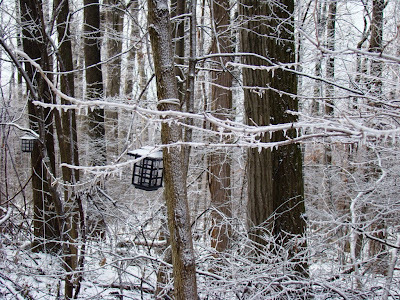 Each of the species that visit the feeders has a distinctive species "birdsonality." Juncos come across as gentle and polite to me. 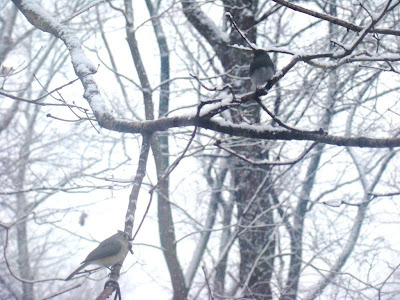 Chickadees and titmice are rather hyperactive. Nuthatches are scrappy. Goldfinch seem a bit stolid. Blue jays are bold and brassy. Downy woodpeckers are focused. One thing I’d never fully appreciated until I started this blog is just how much the light changes throughout the year. 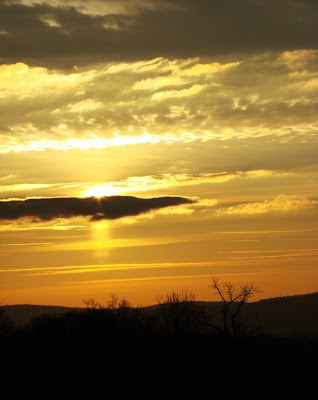 When I take photos for Roundtop Ruminations, I archive the photos by month. When I look at my July photos, say, the light is visibly much different then than it is now. Although I was aware on some level that the light is weaker in winter than in summer, it’s quite another thing to see the evidence in my hands. Today’s photo suggests just how weak natural light is near the winter solstice. I took this photo on Saturday afternoon, sometime between 2-3 p.m. The shadows are already rather long. The light is weak and pale, with little warmth, undistinguished. That’s the light of winter, when just a few degrees in the path of our sun changes the light and temperature across the earth. 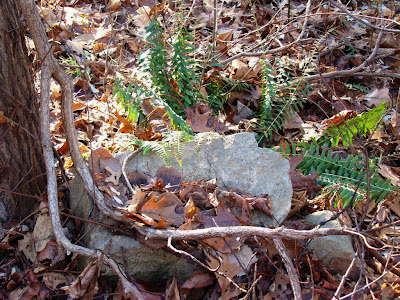 The fern in this photo is a Christmas fern, so named because the plant’s fronds remain green through the winter. During Victorian times, the bright green fronds were used in Christmas decorations. Today, I find the color welcome in the vastness of brown that covers the mountain right now. Color is difficult to find at the moment, and any shade that isn’t brown stands out like a welcome beacon. Saturday dawned clear and bright, an unexpected surprise when I stepped out of the bedroom and realized I could see for miles. I didn’t appreciate just how much I’d missed seeing my northwest to southern skyline until it stopped me dead in my tracks. It has been two full weeks since I’d seen that view. Two weeks since I saw sun bright enough to make me squint. During the work week in these days of shortened daylight, I get used to leaving the cabin before it’s fully light and then not returning home until after dark. Last weekend was rainy, foggy and never got very light even during the day, so I couldn’t see much even when I was at home during the day. This weekend, the weather finally cleared, and suddenly I could see for miles again. In another week, the light will pass the far turn and begin its slow increase again. Is it any wonder why the winter solstice was so celebrated by those who came before us? In the long eras before electricity, the long nights must have weighed very heavily on people. They didn’t have electric lights or full-spectrum lights or much of any lights at all to brighten the night’s long hours. We do have such things, and even so the thought of longer days to begin in just another week is enough to brighten my mood. It’s no wonder to me that many calendars start the new year with the first coming of the longer days. The longer days mark a new beginning, a new revolution of the circle of the year. I think I will mark the occasion this year, too. I will light a candle for those who lived before, who lived before humans learned to push aside the darkness and for whom the coming of the year’s new light was a day of celebration. Today, I can understand why that was so important to them, and for this lesson, I will give thanks. For a few moments this morning, I toyed with the idea of simply running the same dark and foggy forest photo that I posted earlier this week. The mountain has looked the same for several days now. The only thing that’s different from that earlier photo, and you can’t see that anyway, is the temperature has dropped about 20 degrees. Nearly three inches of rain and sleet have fallen here in the last 24 hours or so. Even when it was "warm" enough to rain, it was a bitter, biting rain that kept me from wanting to spend much time outside. I ventured out with the dogs, feeling the sleet hurt my face with its tiny stabs of ice. At first I was surprised that didn’t seem to bother the dogs. Baby Dog, especially, hates to get wet and needs to be prodded even to walk through a tiny puddle. She didn’t seem to mind the sleet. I think her fur coat kept her from feeling its sting. I have no such protection for my face. I turned to face the opposite direction, but the sleet seemed to be coming from everywhere so even doing that didn’t help very much. Instead, I holed up in the warm cabin, drinking tea, reading and generally feeling as snug as a squirrel in its warm and leafy nest. There’s something to be said for a little hibernation, at least occasionally. Still, I am ready for a little sunshine. I don’t think I could ever be one of those all-winter hibernators, like bats or frogs. I’m more like a bad weather hibernator, a raccoon, perhaps. Last night I’d no sooner gotten home from work and briefly run the dogs when my electricity went out. I don’t think I’d even gotten my coat off. I’m used to dealing with frequent power outages. I don’t understand why I have them so frequently, but I’m used to them. I keep the lanterns, the hurricane lamps and candles handy. They are a permanent part of my cabin décor. I reported the outage to the power company who told me it would be fixed in about 90 minutes. That didn’t sound too bad, so I decided to wait to prepare dinner. I keep food handy that doesn’t need to be heated or refrigerated, but it’s not very exciting stuff. I know my refrigerator will keep the food in it for at least 48 hours if I don’t open the door, so I wasn’t about to start opening the refrigerator door. I have my backpacking stove and assorted freeze-dried and emergency food, but I don’t like to use that for short-term events, preferring to save it for more serious or long-term outages. My neighbor down the mountain started his generator. My neighbor up the mountain called out for pizza. Ninety minutes came and went, and I had no sign of returning power. I called the power company again. Oh, they said. You’ll have power by 8:30 (another 90 minutes). So, I gathered an apple, an energy bar, some crackers and peanut butter and had dinner. The cabin is tight, and the weather outside was still in the mid-40’s, so I was perfectly comfortable. The inside temperature only dropped a single degree. I settled down with that book I haven’t found the time to read much lately. Eventually, I looked at the clock. It said 8:30 and I still didn’t have power. So I called the power company for an update. Oh, they said. You’ll have power by 10 p.m. (yet another 90 minutes). Are you starting to notice a trend here? So was I. I went back to reading my book by candlelight. I finally finished my book and then it was 10 p.m. Can you guess what happened next? Right. I still didn’t have power. And the power company reported—you guessed it—that I would have power by 11:30 p.m. So now it was time to think about getting ready for bed. I used a bit of my stored water to wash and give the dogs fresh water. Then it was time to open the cabin door, let out some of the precious warmth and run the dogs for the last time. I put on my headlamp. I gave both dogs stern warnings. Tonight, there would be no tom-foolery. We were to exit the door quickly and calmly and then they were to wait nicely while I closed the door behind me. Re-entry was to follow a similar pattern. They wagged their tails politely. Amazingly, I had compliance. Back inside I got ready for bed. I set my wind-up alarm clock for morning. I put on my pajamas, sat on the bed, removed my flip flops and was leaning back into the bed when---the power came back on. Well, at least I won’t need that extra blanket I laid out in case the cabin cooled over night. And, I finally finished that book. I’ve said it before, but it’s still true. There’s never a dull moment. Not more than a week or so ago, I complained about how gloomy one particular morning was. I was wrong. That was nothing. This is gloom. The weather this week may take the cake for its extremes. Snow and temperatures down to 14F, followed 36 hours later by rain, fog and 55F. Don’t like it? Well, tonight the temperature drops again and will bring rain, sleet, ice and snow. Whatever I decide to wear in the morning, I need something entirely different by afternoon. It’s pretty funny, actually. Two days ago I wore my parka and snowboarding pants. Last night I stepped outside the cabin in a light rain jacket and flip flops. I smelled rain and a skunk, which I thought would have been in hibernation by now. Perhaps it was, until the warmer temperatures woke it up for a day or so. Tomorrow I will need the parka again. I can’t keep track. At this rate I’ll soon end up in a parka and flip-flops. Today’s photo is my front "yard." Actually, I call this my front forest. There really isn’t a commonly used phrase that replaces the word yard but that describes what I have. If I say the word yard, the rest of the world will picture grass. I don’t do grass. This is what I have where a yard would be if I had one. 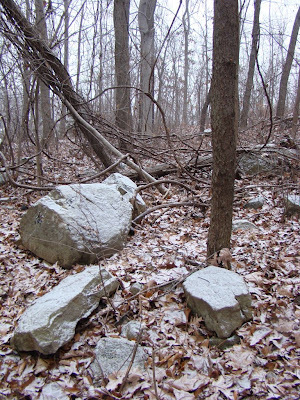 I do have some decent boulders around the back of the property, but I think these particular rocks were moved from their original spots, where they had been for unknown millions or billions of years, when the cabin was built. These rocks look as though they are sitting on top of the ground, not "growing" up out of it; that’s why I think they were moved to this spot. Truthfully, I’ve never understood the whole "yard" thing. What’s the point of having grass? I don’t get it. Even if I lived somewhere that came with a yard, my mission would be to get rid of it. I would either have 100% garden or natural landscaping or, if I lived someplace that would allow it, I would revert my new yard to a forest. I can’t tell you how many times I’ve seen people build a log cabin in the forest, and as soon as they move in, they cut down the forest and put in a yard. Why would you move to a forest and then make it look like a subdivision? I just don’t get it. And another thing: grass is so boring. It’s a plant monoculture. Grass doesn’t really support much of anything that’s part of the natural world. Whether it’s birds or insects or animals, a varied landscape creates more variety. But obviously, I’m almost alone in this thought process, because people are really, really into their yards. And another thing: you have to mow grass. What’s up with that? I never have to mow my forest. I can just go out into the front forest and enjoy it. I don’t have to trim it, mow it, buy expensive lawn equipment or anything. I just don’t get grass. As you can see, I received a bit of new snow. This photo was taken as the snow was still falling. I actually ended up with about an inch of new snow. Doesn’t my front forest look great in the snow? I think so. 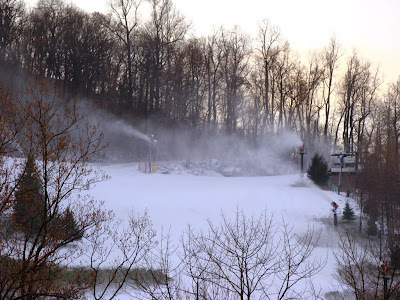 Winter is arriving a bit early to Roundtop this year. Although 15 is not a record low temperature for this time of year by at least 10 degrees or so, when you combine 15 degrees with a 25 mph wind, it feels pretty darn cold. I dug out my parka and my waterproof snowboarding pants, which are a great windbreaker. I could barely move but at least I was warm! 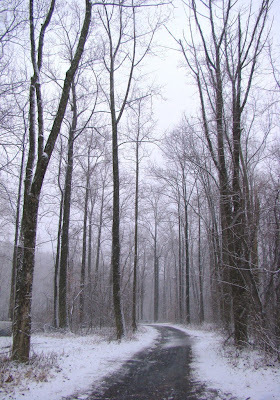 Saturday night brought a little natural snow to the mountain, not much but enough to cause a lot of traffic accidents. The wind and the snow made visibility almost zero. At my cabin, the car was parked. Unfortunately, the dogs weren’t. I’d love to know what it is about snow that makes the dogs so wild. Baby Dog is the worst. Snow makes her deaf and wild. She doesn’t listen to anything I say. She runs from one end of the flexi-lead to the other with a crazed, happy look in her eye. Then she reaches the end of the lead and doesn’t bother to stop until my arm is nearly jerked out of its socket. You’d think it would hurt her neck, too, but you’d never know it by the number of times she pulls this stunt. The ski resort has blown snow all weekend, making new snow 24 hours a day. Sometimes I hear the distant sound of snow guns when I’m out with the dogs, but mostly this weekend’s wind drowned out that sound. It was the kind of weather that makes me want to hunker down in the cabin and not go anyplace. I think I’ll wait for a day when the wind is calm to head down into the woods again. The cold I love but that wind can go someplace else! This week was such a busy one for me that I’ve barely had time to notice what’s going on around my cabin doors. This morning, I finally had a chance to draw a deep breath and look around. That’s when I saw the sun rise this morning. Finally, something that stopped me in my busy tracks. The shaft of light below the sun is a bit of a lower sun pillar. Sun pillars can be either above or below the sun, sometimes both. Usually, lower sun pillars are less common. A sunrise or sunset that’s partially shrouded by clouds, as is this one, is when you see sun pillars. 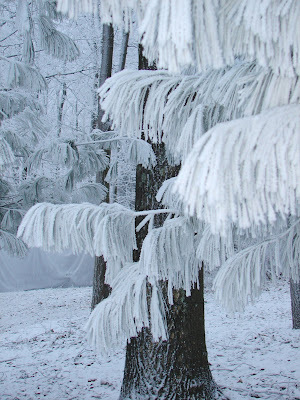 They are caused by light reflected from ice or fog crystals. You can sometimes see them with the moon, too, and even with street lights under certain conditions. The coldest weather of the season so far is now moving in across my mountain. I am finally as ready as I am going to be for winter. I was a bit lulled into thinking I had more time by the milder falls of the past few years. This year the weather is more typical again, which means I don’t have until early December before winter throws its first punch. This week I was racing to finish all my outdoor cabin work and projects ahead of the weather. I promise not to let things slide so late in the year again. Now I am finally done. Let the winter begin! Roundtop Mtn. has that pre-snowfall, post-November gloomy look to it this morning. Clouds darken the sky and everything has that same flat shade of bark brown. Four deer stood among the trees this morning just off the road, and I almost didn’t see them. They were exactly the same shade of brown as the trees. Locally, I’ve heard a sudden concern over a lack of acorns. So far, biologists are just starting to realize that this isn’t a local event but something that’s being seen pretty commonly throughout many areas of the country. No one seems to know what is causing it. Some say a wet spring is the culprit. Some say it’s just a normal low-end of the acorn cycle. Some fear climate change. I don’t have many acorns either, though I had some. I do know that oaks, even when they drop acorns, don’t commonly produce viable seedlings from those acorns. It can be 15-20 years, I’ve read, before you reach a season that results in many new oak seedlings. Some people are worried the squirrels will starve to death. I can’t see that happening here. I see squirrels every day carrying huge walnuts from one side of the road to the other. They seem to be finding plenty of those. I haven’t seen many hickory nuts this year, which in my part of the woods seems even more noticeable than the lack of acorns. Deer rely heavily on such nuts during winter, and if any animal is going to be hurt by the lack of nuts, I expect it will be the deer. This would be especially true if the winter turns out to be a severe one, which I’m still thinking is a possibility. With no moderating influences from El Nino or La Nina this year, a severe or at least a normal winter wouldn’t surprise me. And in fact, both the summer and fall here have tended toward cooler rather than warmer temperatures. In any event, for the moment, noticing the lack of acorns and other nuts is the first step towards finding out what there aren’t many. This is something I expect we will learn more about as more people investigate. For now, the squirrels are busy emptying my bird feeders, and the deer are enjoying the apples I throw out for them. I’m doing my part to see they make it through the winter, acorns or no. Yesterday afternoon, I suddenly heard a racket on the roof like I’ve never heard here before. I first thought it was the mother of all sudden rainstorms, but when I looked out the door I saw large icy things bouncing to the ground. I first thought "huge sleet" and then, "no, hail." So which is it? I had to check my weather definitions to be sure, and even after doing that I still think I had both. I think the first few seconds of the bouncing, large icy things was hail. Then after a minute or two, the large icy things were not longer quite as large, and they might have been sleet. Sleet forms after it falls from a cloud. Hail is formed inside a cloud when water is forced upward, usually by a thunderstorm cloud. 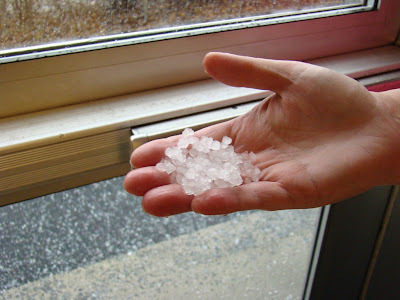 Typically, hail comes in warmer weather and sleet in winter. We did have a clap or two of thunder when this brief but intense storm first came through. I think we went from hail to sleet to rain, all in the space of less than five minutes. Yesterday was one of those wild weather events. Does Dog look guilty to you? He should. And even if he does, he doesn’t look nearly guilty enough. As I reported yesterday, rifle deer season opened in Pennsylvania Monday morning, bringing hunters up my private lane and past the cabin. So, the dogs are not being walked beyond the driveway to the cabin for a bit. As a result, I am now the unproud owner of two wild, exercise-deprived dogs. This morning Dog showed me just how bad a thing this can be. So it’s just after 5:30 a.m. and the two of us are walking along the driveway when one of the hunters, in a big red pickup slowly starts to inch his way up the lane. In the first place, Dog hates vehicles, and more than that, he hates vehicles other than mine coming up the lane and worst of all, he hates pickups. A pickup coming up the lane towards the driveway to the cabin is the worst of all possible evils to him. So Dog goes wild. He lunges against the leash and won’t stop. Before I know it, he has pulled the leash out of my hands and goes running up the lane after the pickup. There I am in the complete darkness of early morning, hurrying up the mountain on the second day of buck season, chasing a dog who’s chasing a big red pickup. I yell for Dog to stop. That does no good. I try to call him to me. That does no good. I keep heading up the road, yelling for Dog, hoping the pickup guy, who at this point probably doesn’t even know Dog is chasing him, isn’t planning to hunt over in the next county. Near the top of the mountain, as I am running out of breath, the road reaches an abandoned ski slope, and along this grassy area I see the pickup guy stuck inside his truck because Dog won’t let him out. I grab Dog, who still needs to be dragged away. In his mind, he’s caught the pickup, it's now his, and he isn’t going to give it up. I apologize profusely to the guy who was hoping to sneak into the mountain to go deer hunting, and pull Dog back down towards the cabin. And all this before 6 a.m. in the morning. Drama like this I don’t need. I probably ruined that poor guy’s day of hunting. The deer around the cabin are used to humans, though, so perhaps to them it was no big deal. Life in the big woods—there’s never a dull moment. My view of the mountains to the west of the cabin is completely back now. A lot of folks might not think this is anything spectacular, but after being encased in green leaves that kept me from seeing past the large oak in the foreground for six months, I think it’s pretty special. Even though I only have a view for the coldest months of the year, I will still sometimes wrap myself in a warm blanket, grab a hot chocolate and plunk myself in a chair on the back deck to watch the sun set in the west. This morning the fog was thick enough to slice for breakfast toast. I couldn’t see anything, even with the headlamp I use when I walk the dogs. 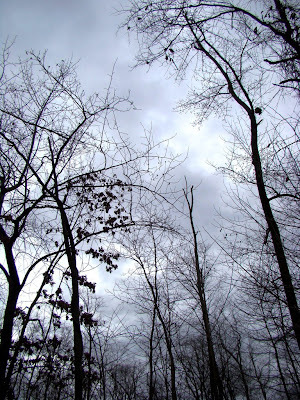 The weekend brought a cold, wet rain to my woods, the kind that is bone-chilling no matter how many layers I wear. Sunday morning it was sleeting for a few hours, and even after the precipitation turned to rain, it only did so by a degree or two. Today marks the opening of Pennsylvania’s rifle deer season. As a result, the dogs didn’t get a walk out of the driveway this morning. Although the season is open for 2 weeks, the first 3 days and the weekends are the busiest times. Still, by the time the hunters no longer drive past the cabin in the pre-dawn hours, I will likely have two exercise-starved crazy dogs to deal with. For that reason, I am always glad when the activity of this season abates. 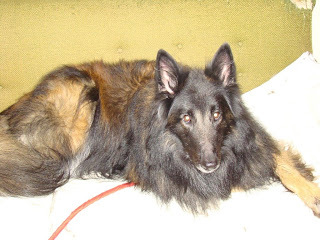 Baby Dog doesn’t look anything like a deer, but Dog has been thought to be everything from a bear to a wolf to a deer, at not very great distances by people who should know better. So I take no chances. 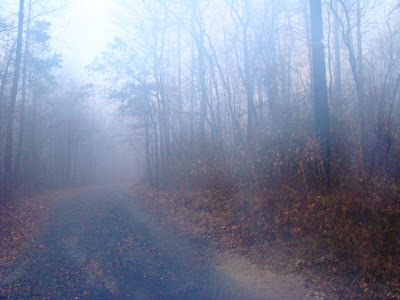 For now, I will stay close to the cabin and wait for the fog to lift, wait for the hunters to move on and wait for the weather to clear before I wander deep into the woods again.